Increase your clients’ industrial flooring options by stocking high-quality engineered glass floor tiles from Nalboor Tiles. As a reputable wholesale and manufacturing company in South Florida, we take pride in offering a wide selection of materials that come straight from the source. Whether you’re a builder, retail supplier, or an architectural engineer, we stock the premium products your clients demand without charging a premium price. These tiles are classified as engineered stone, and they’re crafted at our own facility. Laminated Marmo Glass tiles offer a new generation of flooring for a variety of commercial settings. Our tiles can be cut just like glass, but they’re in a more flexible, compact form than traditional laminated glass flooring. Laminated Marmo Glass flooring tiles are polished and finished with a slightly beveled edge and they offer a highly reflective surface. They can also be textured to reduce slip and fall incidents, and they minimize the appearance of scratches and scuff marks. The reflective property of Marmo Glass floor tiles minimizes the impact of UV rays on the material while offering an elevated degree of visibility in low-light areas. This makes crystallized glass tiles a prized selection in settings where you want to create a soothing environment or impart a look that’s ultra-modern and pristine. It also permits a high degree of sound reduction. In addition to its strength and versatility, architects favor Marmo Glass tiles for their aesthetic properties. The light, airy feel offers health benefits, improves mental and emotional well-being, and boosts productivity. That makes this floor tile a wise selection in wellness centers, spas, and other spaces that benefit from that type of atmosphere. Since design architects are trying to find new ways to capitalize on southern exposure in buildings without increasing glare or sun damage to interiors, Marmo Glass offers a superior level of UV protection that can reach up to 99% reduction. In small areas or when renovating spaces where optimal window placement isn’t possible, these tiles allow interior designers to reflect soft illumination where it’s needed most. The process for producing laminated glass tiles is similar to the method for creating bullet- or shatter-proof windshields and windows, which qualifies it as a safety glass. A laminate is pressed between panels of crystallized glass that are 2 – 3mm thick, ensuring that even if one panel cracks, the whole remains intact. That type of construction adds to the durability of the material, rendering it impervious to damage. These tiles also eliminate water absorption as well as resisting stains and scuff marks. The porcelain backing adds beauty that’s comparable to pure white Thassos marble tiles while increasing strength, making it ideal for high-traffic areas in hospitals, restaurant kitchens, and bathrooms. Because our tiles are strong, they make a viable alternative to traditional glass tiling. They’re also a cost-effective substitute for marble when aesthetics are important. 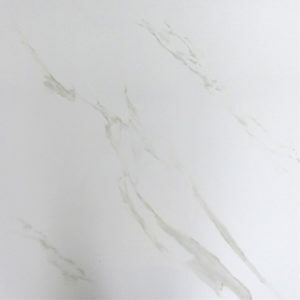 The thickness of the white glass on top of a porcelain backing makes it sturdy, and all of our tiles are floor-grade. If you are looking for a white flooring material that offers a consistent color and quality, this is the product to go with. Laminated glass tiles disrupt sound waves that travel through the material, offering superior noise reduction in industrial settings. They can also support heavy weight and withstand blows from solid objects or fallen industrial equipment. Caring for a Laminated glass floor is easy. Simply use mild, non-abrasive cleansers and equipment, and sweep thoroughly before mopping to remove loose debris. You should also avoid using oil- or wax-based products and those that contains dyes or color. Nalboor Tiles carries floor cleaning products as well as sealants and enhancers that are specially formulated for use our flooring materials. The minimum purchase is one full crate to qualify for the lowest price. If you’re ordering 3,000 square feet of flooring tiles or more, please click here to request a quote. An associate will be happy to provide you with a special container price straight from our warehouse. You can also request a free sample to check out the quality of our product before you buy. Our goal is to make it easy and efficient to order tiles in large quantities. We offer several ways to get in touch with a flooring expert, or you can stop by our distribution center at 9605 NW 13th Street in Miami. Call us directly Monday – Friday, 9am – 5pm EST, at 1-305-501-4548 or contact us any time online; we also offer 24/7 customer support. Whatever way you choose to reach out to Nalboor Tiles, do it today.